Q. How can I determine if my VoltAlert is being recalled? Q: Why is Fluke recalling this product? 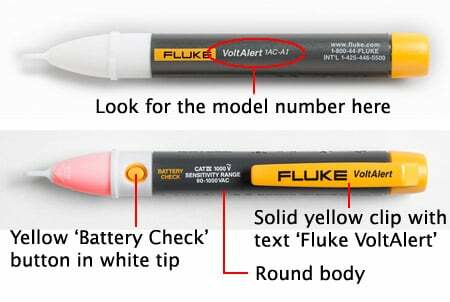 A: Fluke is voluntarily recalling its Fluke 1AC-I VoltAlert® voltage tester because the voltage indicator red light can fail to illuminate, which can mislead a user to believe there is no voltage in the circuit that is being measured. This can result in serious injury or death from electrical shock or thermal burns, or death by electrocution. Q. How do I know if the 1AC-AI is defective? A. You can't tell if it's defective or not. The defect may become apparent without your knowing it. Your product is recalled even if it seems to work correctly. Please stop using it immediately! Q. Why do I have two choices to replace the 1AC-AI? A. A replacement unit is not available yet. Therefore, Fluke is offering you a choice of two products, each of which has a higher price and more features. Q. What is the difference between the Fluke 1AC-II and Fluke LVD2? A. There are several differences, consult the comparison chart ». Q. What is the difference between the Fluke 1AC-I (Recalled unit) and Fluke 1AC-II? Q. What is the fastest way to return my Fluke 1AC-I for my replacement? A. Fill out the online form or call the recall number 888-973-5853 between the hours of 6:30 AM to 3:00 PM Pacific Standard Time, to receive a postage paid return envelope to submit your product. Q: What happens when I call the 1AC-I Recall phone number after the normal operating hours of 6:30 AM to 3:00 PM Pacific Standard Time? A: You will hear voicemail instructions on how to submit your request for a 1AC-I mailer over the phone. Q: Can I take the unit back to my local dealer to get the replacement models? A: No, to get the replacement units, you need to follow the return steps listed on the customer letter. Q: What does Fluke do with my information once I submit the online form? A: Fluke uses this information to send you the necessary package to return your 1AC-I. Q: How long will it take to get my replacement unit? A: It could take up to 3 weeks depending on shipping and how you submit your return request. Q: What if I forgot to select a replacement model when I returned my 1AC-I? A: If you did not select a replacement model, Fluke will automatically send you a Fluke 1AC-II. Q: Do I have to pay freight to return my 1AC-I? A: Only if you select to use the form attached to the customer letter and you mail the unit yourself. If you call 888-973-5853 or fill out the online form, Fluke will send you a prepaid envelope to return your 1AC-I and then we will ship your replacement unit free of charge.